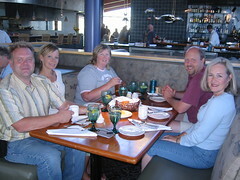 We spent Sunday and Monday in Lynden with Esther's family. It was good to catch up on eachother's summer activities. Bjorn and Jenny spent Sunday afternoon with us. He had been in his first accident that morning. Fortunately, it was a minor accident and it wasn't entirely his fault. His bumper is all messed up, but it doesn't effect performance. On Monday, the adults went to Anthonys and then for a walk in Fairhaven where we made and interesting aquaintance with a young man. (see Flickr pic) The weekend was a nice getaway before the school routine begins.